March Recap + $100 Amazon Gift Card Giveaway! Entry is super easy – all you need to do is to leave a comment on ANY blog post during the month of April and you are automatically entered. Every comment you leave counts as one entry. So remember, more comments = more chances to win! NO PURCHASE IS NECESSARY. 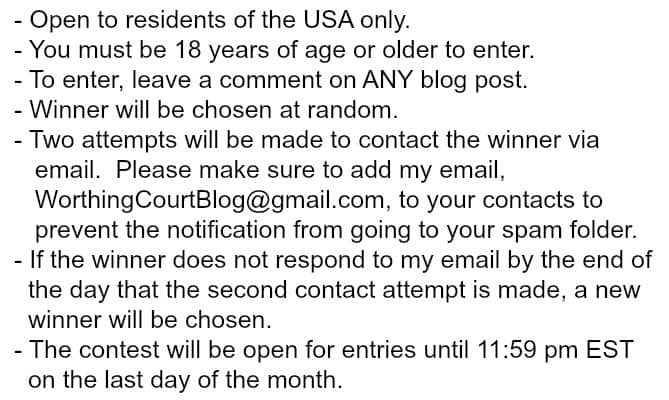 SEE BELOW FOR CONTEST DETAILS. THIS MONTH’S CONTEST WILL END ON APRIL 30TH AT 11:59 PM EST. Let’s catch up on what went down here at Worthing Court during March. Simply click on the title to see more about any project. MY FAVORITE PAINT TO DECORATE WITH – AND I’M NOT TALKING ABOUT THE WALLS! April is shaping up to be another busy month. I have high hopes that get my foyer makeover will be completed! Make sure to read over these giveaway rules. Always love seeing anything that you do. Great farm house ideas. Thanks for sharing your wonderful taste. I love the way you change a room with just a few pieces of color for the season! The board and batten walls in the entrance hall are stunning!! Love getting your emails. Everything is so beautiful. Thanks for always sharing the best ideas and being such inspiration. Enjoy the weekend!! I really love reading your blog! Thanks so much for sharing this with us!! Your home is so lovely! Thanks for the recap! I love your home! So bright, cozy and welcoming! Thanks for sharing! Super excited for this giveaway! You have linked so many cute things to order from amazon. Love all your painting projects….I am going to try your spray paint. I love looking at all your ideas for creating a beautiful home! The before and after pictures are my favorite! You had me at Amazon! It’s always the first place I look when I want to order something. Love your blog, btw. Your home is so beautiful! Love the flowers on the dining room table. A splash of color adds so much! I love the breakfast room with all the greenery. It is so fresh! You give me so many great ideas for my home…thank you. I could really use an Amazon gift card. I’ve gotten so many good ideas from your blog, and I’m currently redecorating our living room, kitchen and nook. All the rooms are open to one another and we are in the process of painting them. I will also paint a lot of my accessories to give them a fresh new look. I’m going for a layered, beige, tan and gray color scheme. I want to be able to change my accessory colors any time because I love decorating for holidays throughout the year. I love your blog! I so look forward to your daily emails. Love your home! So refreshing! I love all of your spring accents! The green just suits my taste perfectly! Thanks for your recent post on Rustoleum Anodized Bronze paint . I plan to spray paint a beat up dressing table with it rather than use chalk paint. It’s the color I have been looking for. How does it look on damaged finishes? What prep work would be needed? Hi Linda. Can you be a little more specific about what type of damaged pieces you’re talking about? It’s hard for me to give a generalized answer about that. 😀 The only prep work that I’ve done on any of my pieces is to wipe them down with TSP, to remove finger print residue and any accumulated dirt. I sure would love to win this one this would be fun. i am so crazy for your family room. i sent your board and batten idea to my son to help wake up his bedroom. thank you always for your inspiration. and thank you for this generous giveaway. I like the “Small Touches”. Thanks for the inspiration prompt! I love that chandelier in the 1st photo and can’t wait to try the Blueberry Cobbler. My teenager is a blueberry freak. Can’t wait to see what April brings. Looking forward to your ideas. Such pretty decorations! I love these ideas! I’m stealing all of your painting ideas!! keep up the good work! Love the green plates behind the white in the breakfast room! Very cheerful! Thank you for sharing your lovely home and ideas. I always look forward to your blog. Love, love, love all the Springtime ideas……thanks for the inspiration…. Thank you for sharing your decorating craft. All of your ideas are “doable”. Loving all of the green!! Heading to Michaels and Hobby Lobby today feeling very inspired by your blog!! I love the citrus green you have added to your dinning room décor…I found the green plates yesterday and will be using them in my Easter Tablescape.. I just love your blog..
Love all the greenery . I need to work that in my home. You have so many great ideas. I definitely will be using a few of them. Thanks so much for everything. Very “Spring-y”. So fresh and comforting… a very nice home. Thank you for the give-away opportunity. I loved your idea on how to get an easy shiplap wall! I am going to make this my next project! Thank you for the great idea it doesn’t sound scary at all. Reading these blogs is one of my favorite things to do on the computer. Thanks. Look forward to daily info! Love all the green ÿouve added in your breakfast room – it’s so cheerful! Love your blog, so much usable info and tips. Thanks for sharing!! Love all your projects, keep them coming! Your dining room and breakfast room will be the inspiration for redecorating my dining room this year. Thank you so much for sharing the Rustoleum Anonized Bronze spray paint info, and for the great decorating tips. I love your blog and I love to shop on Amazon! I love your batten wall. It is amazing what pops of green do to a room. 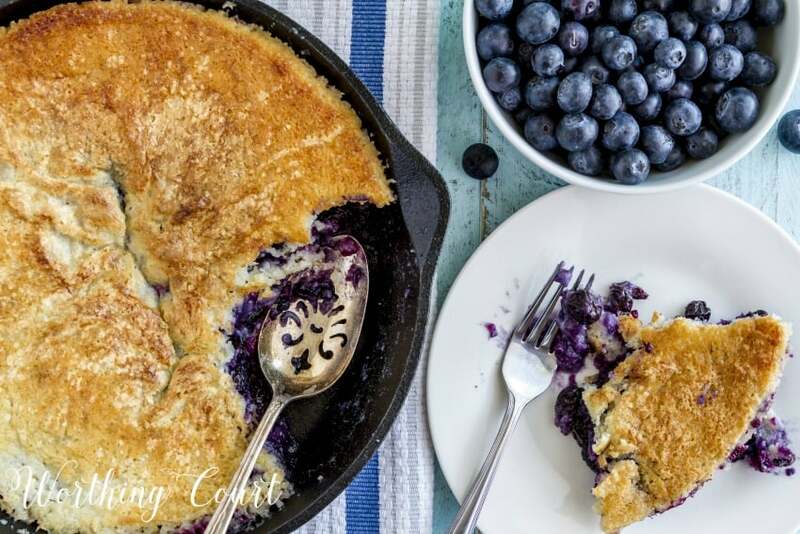 The Blueberry Cobbler recipe looks delicious! I am definitely making it! 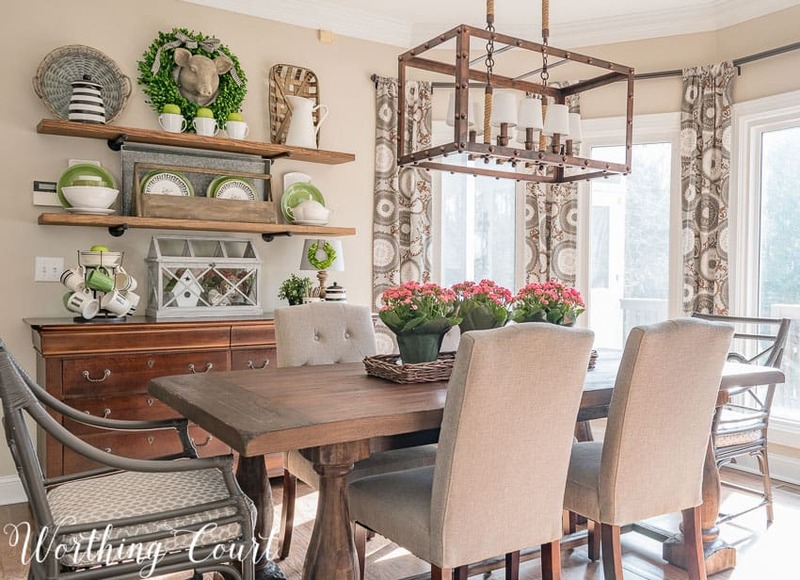 Also love your spring dining room; so refreshing and pretty. I love your home and décor style. Looking forward to April’s postings by you! Thank you! What an inspiration you are! Thank you for all the wonderful ideas. I especially enjoy the links you provide to decor items. Thanks for the monthly give away! So neat, such clean style. Love the bookcase in your office. every one of your posts are filled with inspiration and so many good ideas. thank you for constantly inspiring and thank you for such a generous giveaway. Thanks for sharing your home with us! Your blog is so inspiring! I love your fireplace mantel. Very classic elegance. You inspired me to try a wreath like your moss covered one. It turned out great! Thanks for the chance to win. love Amazon, especially with the links to all the cute things they have. 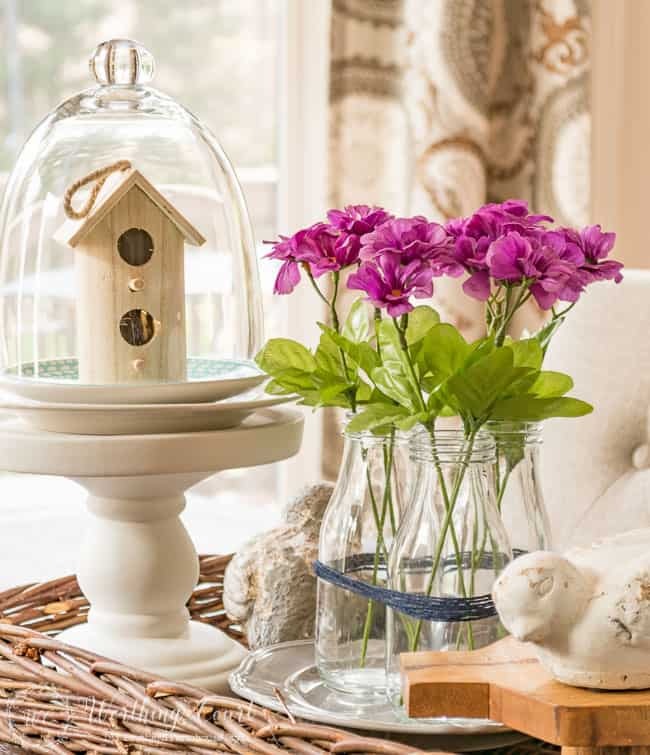 Decorating for Spring and Easter bring the light of the outdoors inside. Your ideas are so fresh and bright. Love, love, love your breakfast room. Suzy, your gorgeous dining room at the beginning of today’s blog only emphasizes my love for neutral decorating. My “base” colors are similar to yours — I call my living room shades of taupe, while many people refer to taupes as gray. I love blues and russets as my accent colors, and both look lovely with my neutral walls (Behr’s Mesa Taupe) and upholstered goods (cream sofa and taupe chenille chairs). In summer, the blues go from Deep Wedgwood (I’m making the name up, but that’s how I can best describe it) to the watery teals of the sea. I especially love in today’s Spring Dining Room photo how those fresh-as-spring greens really stand out against your calming backdrop. It is certainly Pin-worthy! Thanks, as always, for sharing your lovely home! It’s always an inspiration! Love the fresh spring touches in your breakfast area. Your blog is just my style! And I love that you have answered my questions personally! Thank you! Happy Spring! Love all of these ideas! BOught paint yesterday for my typeset drawers. Love your idea. Thanks! Love your style, keep posting enjoy reading your blogs. I want to try the blueberry cobbler recipe. Love the touches of spring. Your home is so beautiful! You truly inspire me to decorate my home! The Amazon gift card is awesome!! I so enjoy reading these blogs. Decorating and home interiors is one of my biggest passions and joys. Thanks for the delights every week. I absolutely love your breakfast room! I’d love to know where you bought your table with the double baluster legs. I saw you posted it somewhere, but can’t find it now. Love your style! I used to call my style ‘eclectic’, until I saw your farmhouse style….I just didn’t realize I was putting it together all wrong! I was never happy with the results. Now I’m just ‘going for it’, and I’m loving how my decor is coming together….even better, my husband likes it, too! Thanks for all the inspiration, Suzy! My fav is your board and batten entry. Love it. I will be doing this cause it is awesome. Always love to see your decor ideas. You have a lovely bright home! Thanks for sharing. I love your blog and look forward to reading your emails every day! I’ve learned so much! I love the blues and creams in the living room. Your pictures and designs are so inspiring. I just love looking at the pictures you share. Your posts are always informative and pretty! Thank you! Love your blog. I look forward to receiving your emails. Thank you! Love your moss covered wreath! Thanks for sharing – I will definitely have to make it. Simply love your dining room light fixture. Never thought to hang a wreath on my fireplace window/screen area. Great idea for the Spring/Summer months when not using it. Where did you get your boxwood wreath, it looks so natural? I can never have enough boxwood around my house! 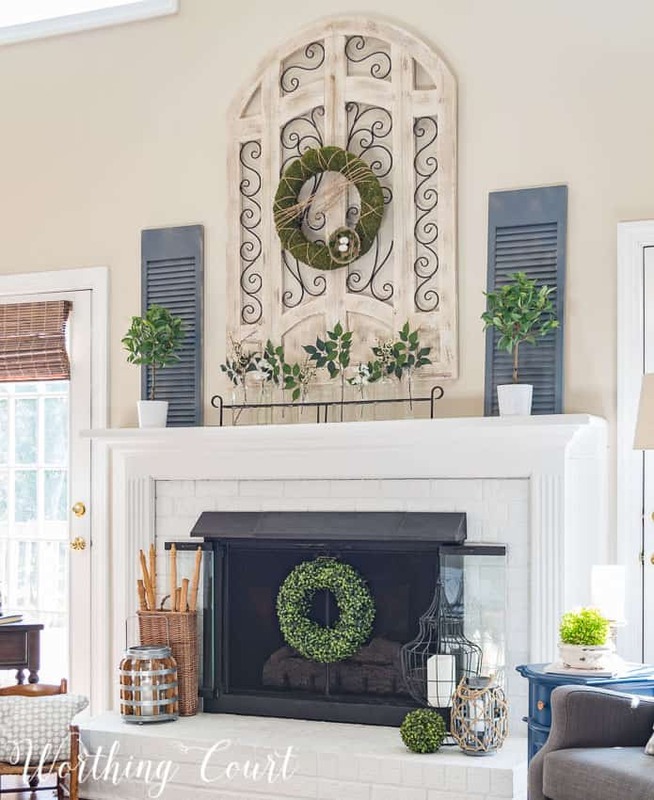 lol That particular wreath, that is hanging on the fireplace screen, came from a local home decor shop. Your style always inspires me. If my foyer had a normal height ceiling I’d do a board and batten wall like yours! 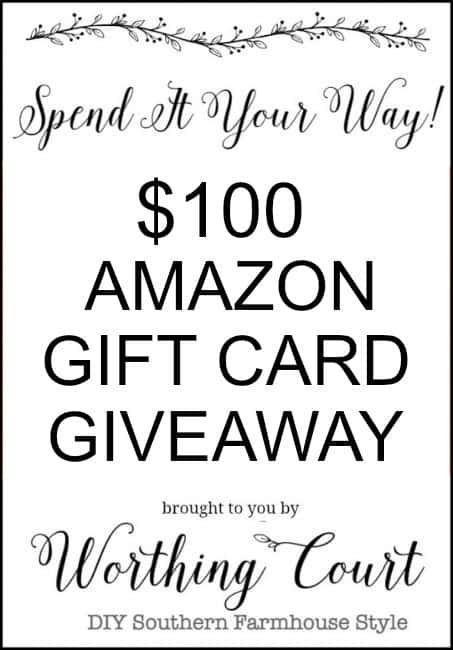 Yes, I think I could find something to spend that Amazon $100. gift card on! Thanks for the offer. AND, I think I need to go back over some of the listed posts as I may have missed some good stuff. Your style is very appealing to me. Just the right number of accent pieces and interesting details. Wonder what May posts you’ll come up with. I’ll look forward to finding out! I really need to add more green, it looks perfect the way you have it, not too much. Thanks, I needed this! Even though my husband doesn’t like farmhouse, I find many elements of inspiration in your blog. Just did a screen shot this morning. Thank you for your beautiful pics! Love your home. I love the curtains in your breakfast room. Is that fabric still available? Sure would look cute in my great room!! 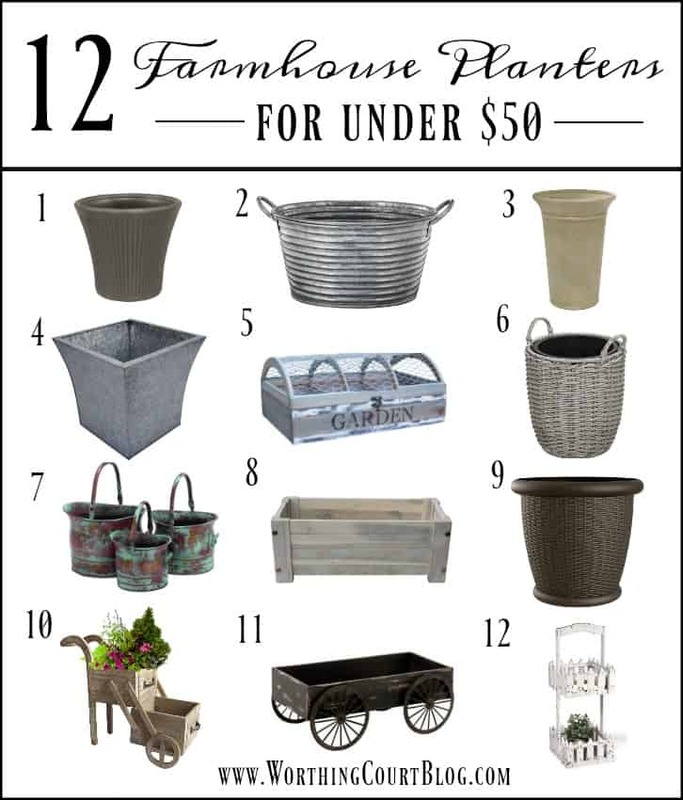 So many pretty farmhouse ideas!! Love them all. I so enjoy reading your blog and seeing the photos. Thanks again. I enjoy the variety of your topics and we aren’t always just looking at the same walls each post. Always anticipate your next posting. Lots of great things? I love everything that you do! Thanks for the awesome giveaway! Beautiful Ideas! I love your style. I am just getting caught up on my email. We have had lots of company. I always enjoy your posts so I will be catching up on your emails in the next few days. Can”t wait to see what is new. Absolutely love all your ideas!! Your boxwood wreath how do you keep them from drying?! And are they salvageable once dried? Any source info on the shelves or the pig head in your breakfast room?? I love them and would love to locate something similar! Your entry way is beautiful! Hi Suzy, want to thank you for always sending a reply to my questions. Have a great day. I love, love, love your blog!!! Have a list for Amazon! Thanks for the giveaway. this is such a wonderful post! I love your blog. I could spend hours reading over your wonderful posts. So inspired by your blog and enjoy seeing the room make-overs. Amazon is awesome, would love to WIN! I love all the decorating in your home My most favorite is the barn door on the bookcase in your office. That is just dynamite! My best to you. Pat. Suzy, love the tour of your makeovers, especially the barn door on your shelving unit in the office makeover. Thank you for info on your kitchen rug. Purchased and looks fab. Than you. 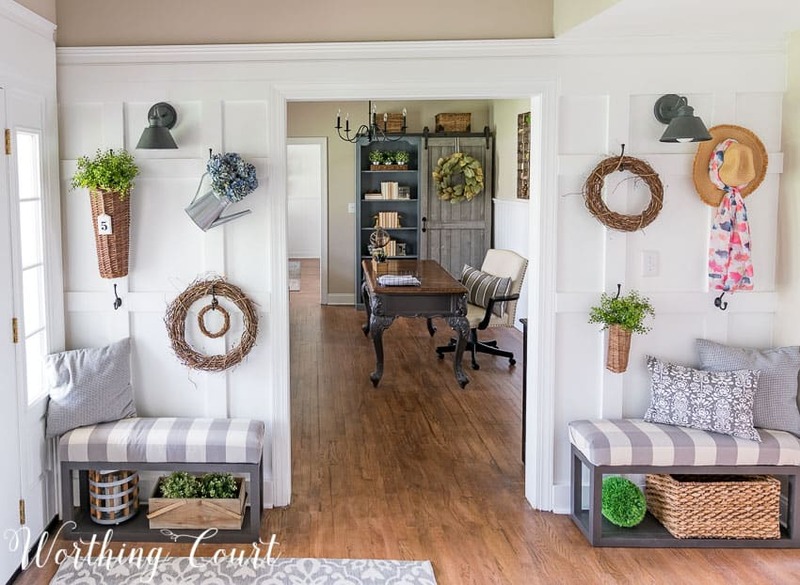 Love your farm house decorating, trying to get that same look in my home. Another awesome monthly round-up of fantastic decorating ideas and inspiration! Always look forward to your posts. Love all the inspiration I get from you. Thanks for sharing!! Enjoy your day! Thanks for the inspiration, I love everything you show us. I look forward to each and every post. My husband, however, does not! ha ha He is tired of my “honey-do” lists as he is not quite as handy as your Pookie! Love your Breakfast Room with the warm wood tones. You don’t see that much anymore these days. Love love love your blog…always look forward to your next post. I’m thinking of putting headboard paneling in my bathroom. Was happy to see how awesome it looks in your dining room. Thanks for the inspiration! great variety of topics. Good choices. Loved the container options. Well, I did it! I bought the Rust-oleum anodized bronze spray paint and it is just as great as you said! Can hardly wait for the rain to stop here in VA so I can get back to my spraying!! Thanks…love your wonderful ideas! I love your blog! I love getting the posts every day. I have learned so much! Thank you! I am only been getting your blog a short while but I am thoroughly enjoying your comments, ideas, inspiration. I live in a 90+ year old home on the family citrus ranch and your Ideas have inspired me to get moving with changes I have been wanting to make. Thanks for the encouragement! lOVE your blog! I am trying to find my farmhouse style and am always interested in how you incorporate different pieces to make it all work! I Love the sign in your dining area…will try and recreate for our house! Wow your style of decorating is amazing. I just was so thrilled when I found Worthing Court? I was inspired to continue some decorating of my own. start again.? Thank you so much. Really enjoy your blog,look forward to see what great tips you give. Your home is beautiful! Yummy looking food, pretty rooms,great friends, I love it all! Your style is so appealing! I am letting you know that I am planning on stealing some of your ideas! Your dining room is the best. One of my favorites on my Pinterest page. Keep those great ideas coming, your home is lovely! I forwarded the tutorial on how to do a staircase gallery wall to my daughter. She has a two story house and since they’ve recently repainted it’s perfect timing for her! Loved the dining room and the color used on the chairs and table. I will be starting my make overs (Thanks to your inspiration) this next month. Good to start moving forward……. Thanks so much for sharing your creativity. You certainly have some great decorating ideas.